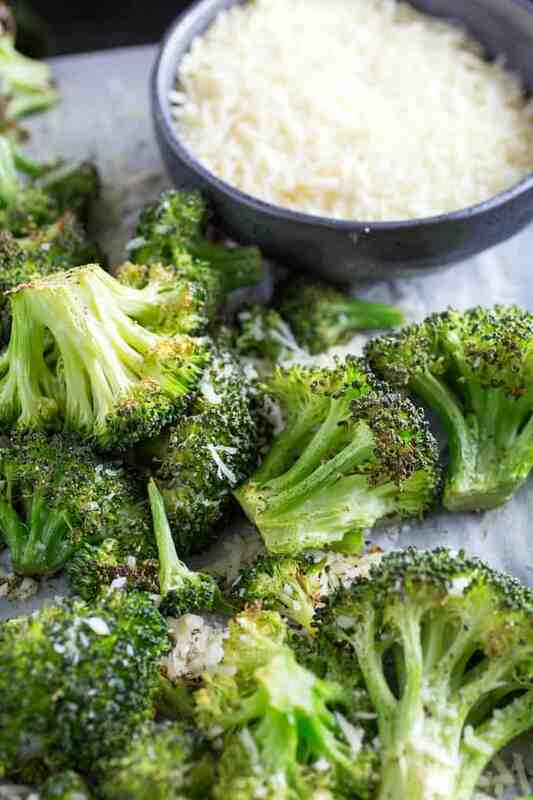 Garlic Parmesan Roasted Broccoli is a quick and easy side dish, made with broccoli, parmesan, olive oil, and seasoning, ready in under 20 minutes! I’m always looking for great side dish recipes with plenty of vegetables, and right now I’m absolutely loving this Instant Pot Corn on the Cob, Simple Cucumber Tomato Avocado Salad, and Zucchini Fries! 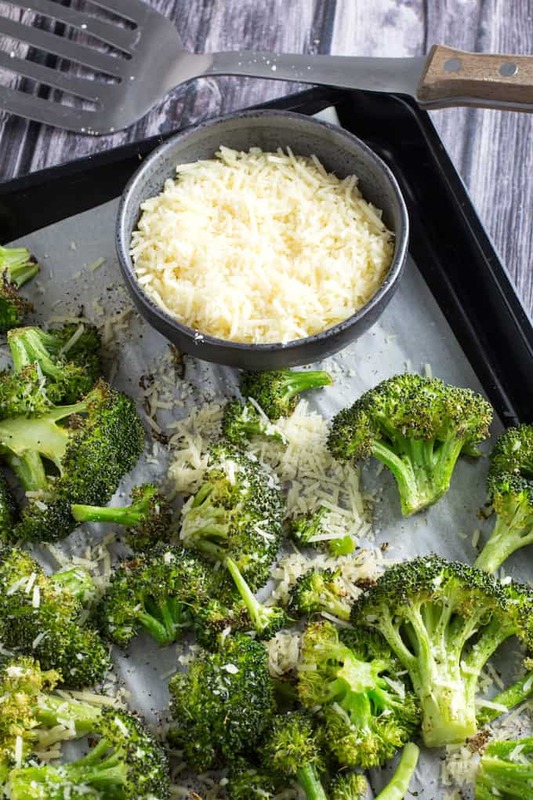 Garlic Parmesan Roasted Broccoli is an unbelievably easy gluten free side dish recipe that’s also packed with flavor, while being totally healthy. This is one of my go-to recipes during the week because it’s quick, easy, and everyone loves it in this house. You can add other veggies, like cauliflower or parsnips, to your roasting sheet if you have some leftover that you want to use up. Or try a sprinkle of gluten free breadcrumbs for some crispy texture! Any way you do it, I’m sure that this will become your new favorite side dish, too! How can I make broccoli taste better? You can make broccoli taste better by adding different seasonings, oils, and using different cooking methods. Personally, I find that roasted broccoli is a lot more flavorful than boiled or steamed, so I’ll throw it on a baking sheet any chance I get. I also like to add toppings like parmesan and garlic powder, but you can add Italian seasoning, lemon juice, cheese, sage, or mix it with other veggies like cauliflower or carrots. If you absolutely must boil or steam your broccoli, do it with vegetable broth or salted water, to add some flavor to the broccoli. What type of broccoli can you use for roasted broccoli? I always like to use fresh broccoli with this roasted broccoli recipe. I’ve done it with frozen in a pinch, and while it’s better than boiling it, you won’t get the same raw crunch that you’ve get with fresh broccoli. Frozen is blanched first, so it’s already partially cooked when you start. 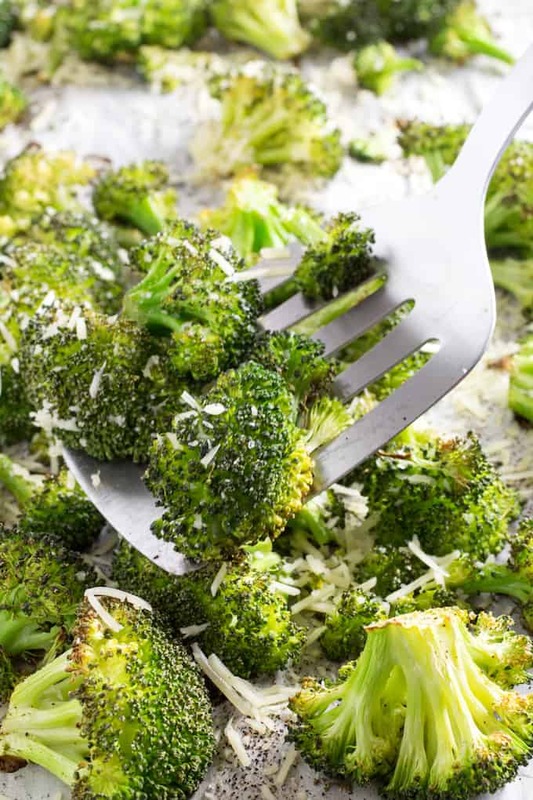 You can also use broccolini, or florets and stalks, or larger stalks of broccoli for this garlic parmesan roasted broccoli recipe. I like to roast this broccoli until I see some golden brown edges start to form on the tops. If you’re not getting enough, you can turn the broiler on for just a minute or two. Be careful, the broiler is really strong and it can burn your broccoli pretty quickly if you’re not watching. 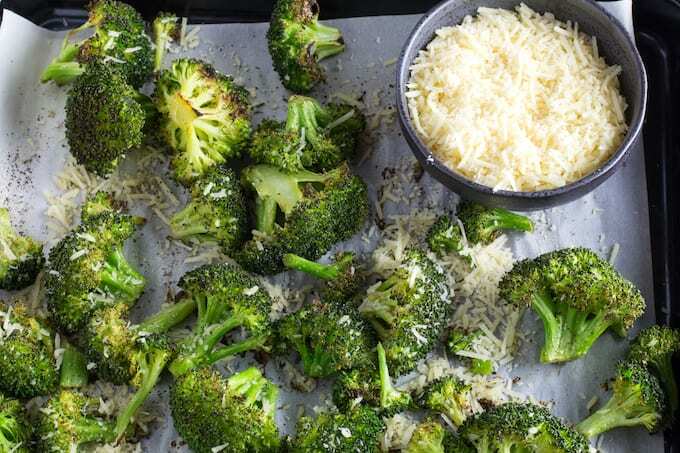 If you want to coat the broccoli more evenly, you can put it in a large bowl and drizzle with the extra virgin olive oil, then toss it to coat. Or, you can use cooking spray while it’s on the baking sheet. 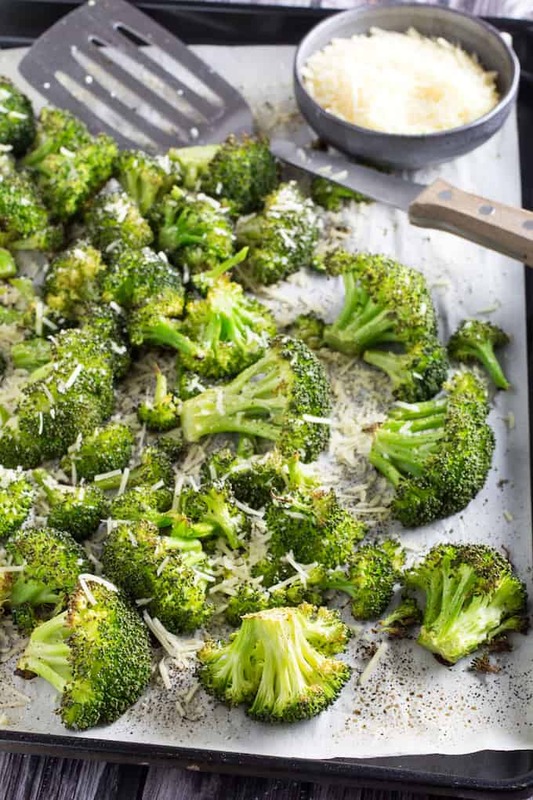 It doesn’t matter what type of parmesan you have to make parmesan roasted broccoli. Grated, sliced, shredded… just go crazy. I’ve used Romano, too. Serve this with fresh lemon wedges to add some nice pops of color and fresh flavor to your table! 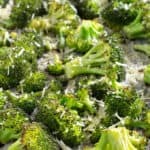 You can also toss these ingredients in a sauté pan over medium-high heat, stirring every few seconds, until the broccoli looks slightly charred and cooked through. Preheat oven to 425F. Line a baking sheet with parchment paper. Spread broccoli out on baking sheet. 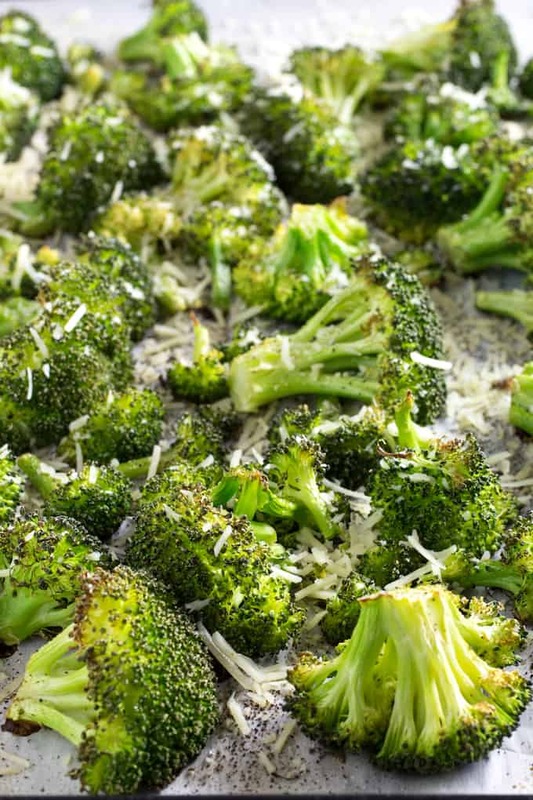 Drizzle broccoli with olive oil and sprinkle evenly with salt, pepper, garlic, and parmesan cheese. Bake for 10-15 minutes, or until broccoli is soft and roasted looking.